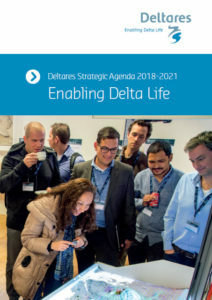 The Deltares motto is ‘Enabling Delta Life’. We use our expertise to facilitate innovative and sustainable solutions for global issues pertaining to the use and risks of water and soil. The form and content we want to give it during the coming years, is set out in the Strategic Agenda 2018-2021. Deltares is an independent research institute. Our independence is a valuable asset. It allows us to sit at the right tables throughout the world, working together with organizations and decision makers that matter and can make a difference. Knowledge is what brings us to these tables. Everything we do is dedicated to developing applicable knowledge on water and soil. In our organization, we connect these two fields. We make our knowledge available to the entire Dutch market; where possible, we work ‘open source’. Deltares distinguishes itself through a combination of freely available software, experimental facilities and staff with a high knowledge profile. In this way, we provide new solutions and insight, thereby bringing (new) social issues to the agenda. During the coming period, we want to extend our position as an independent, influential knowledge institute. We will continue on the same path to achieve both national and international recognition as a ‘Triple A’ institute in the field of water and subsoil. We want to further expand our international position, without compromising our ‘unique selling point’ as a Dutch institute. The quality of our work should be a matter of course. We want to excel in our knowledge of water and soil, and collaborate in areas of expertise where our knowledge can also be of value: food, health, energy and infrastructure. Our knowledge and innovations are sustainable and have been proven effective. Our approach is solution-oriented, transparent and focusses on working with others. To read more about our ambitions, please download our Strategic Agenda 2018-2021.